I got to participate in a ladies’ self-defense seminar at Calvert MMA Academy in Sunderland on November 23. 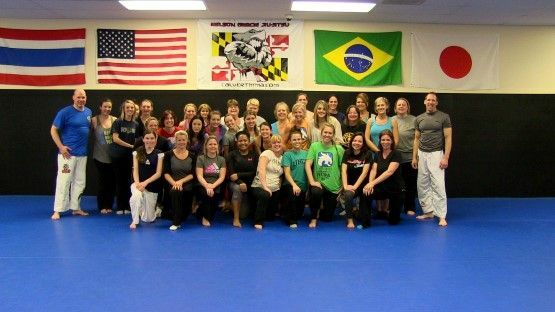 Coach Jim Thrift, the owner of Calvert MMA, led the seminar, and he taught 37 women various self-defense techniques and escapes. It was a great opportunity to learn some real-life ways of protecting ourselves, but it was also an opportunity for each of us to give back to our community. All of the money paid for the seminar was donated to End Hunger in Calvert County. Jim was able to present a check for $1,600 to the organization which is enough to feed 80 families for 1 week. You’ve probably seen signs for End Hunger throughout Calvert County. Their donation boxes are in most major stores, and many people flock to their annual Dragon Boat Festival in North Beach in the summertime or Bike to End Hunger in the spring. But what does End Hunger in Calvert County do? End Hunger in Calvert County was established in 2008 to work with families and move them from dependence to independence. The organization supports local food pantries and raises awareness about hunger in our community. They also have training and support programs to help the homeless and those who need job skills. They are currently working on a life skills training program with Project ECHO as well as training and job programs with the College of Southern Maryland, Calvert Memorial Hospital, and Calvert Cliffs Nuclear Power Plant. According to their statistics, approximately 5,000 residents in Calvert County are hungry and in need of assistance. 100% of the food collected stays in Calvert County, so you can rest assured that when you give food or monetary donations to the organization, you are truly helping a neighbor in need. If you would like to know how you can help End Hunger in Calvert County, check out their website http://www.endhungercalvert.org. The hard working folks at End Hunger keep the site updated with upcoming events and opportunities to serve. Amanda Peterson moved to Calvert County in 2005 after living in New Mexico for almost 20 years. She is an author and freelance writer who writes children's books, ladies' Bible studies, website content, and various online articles. Amanda maintains a blog called Mommy's Answers where moms can go for practical mothering tips and insights from her experiences. To learn more about Amanda visit her website mommysanswers.blogspot.com or find her on Google+.